Happy first week – I know this week feels like a crazy whirlwind, especially compared to the relative calm of summer (for me anyway). Last post I wrote about setting up your scope and sequence as a first step to have a well-connected, logical flow of content and competencies. This post I’m going to dig a little deeper into planning out lesson sequences. Because I live and teach in BC I will be using our curriculum model but if you are teaching in the US or elsewhere, your common core has a similar approach. What we in BC call Curricular Competencies, you call Standards for Mathematical Practice but are virtually the same thing. When we think of designing our math lessons, I encourage you to begin with the end in mind. Take a look at the curriculum and decide what content you will focus on and then what competencies you can engage to explore that content. The end in mind part is really the big ideas. I like to use the analogy of a journey. The car is the competencies while the content is the passenger and the destination is the Big Ideas. Are students being led to a larger understanding through the use of the competencies and tasks you are providing? So my goal is to help my students achieve fluency. I will take a minute here to clarify that there is a difference between memorizing that 4 x 6 = 24 and understanding that 4 x 6 means 4 groups of 6 and can be found by doubling 2 x 6 or adding another 6 to 3 x 6. If students end up memorizing most of their facts this is great but ONLY if they also understand what they mean and have some strategies in case they forget a fact along the way. Keep in mind also that these strategies help students when dealing with operations with larger numbers AND are actually algebraic thinking skills, so important to develop at this age for use in the future. Ok, so I know my end goal is fluency and this is now where teachers often start looking for lessons or games that have students practice their multiplication and division facts….but if we do this we are not engaging in many of the competencies. What are we missing? We are missing the opportunity for students to explore and make sense of a variety of strategies for multiplying and dividing. Doubling and halving are often fairly easy for most students. This mental strategy can be used for finding four groups of a number by doubling the number twice: 4 x 6 = 2 x 6 x 2 = 2 x 12 = 24. This can also be used for finding the eight facts by doubling three times, or the sixes by doubling three times the number. Allow students the chance to find these for themselves. They can use manipulatives to see how this works, which will allow us to also ensure they have a nice visual to think about in their mind’s eye. AND when we use manipulatives to explore this concept we are also engaging in these two competencies: Visualize to explore mathematical concepts and Represent mathematical ideas in concrete, pictorial, and symbolic forms. Before moving into another strategy allow students to share their understanding with their group, partner, whole class by making a poster on chart paper that shows pictures of what they did with their manipulatives and their own words describing how they can do these calculations mentally. This part of the activity will allow them to engage in these important competencies: Communicate mathematical thinking in many ways, use mathematical vocabulary and language to contribute to mathematical discussions, explain and justify mathematical ideas and decisions. Before the lesson ends give students the time to reflect on their strategy: “When might you use this the most?”, “ Why?” “When might this strategy NOT be a good one for you?”, “Why?” “What did you find easiest or most challenging about using this strategy?” “What other concepts are similar to this strategy? HOW?” This process is so important and can be done as homework, as a written assignment. 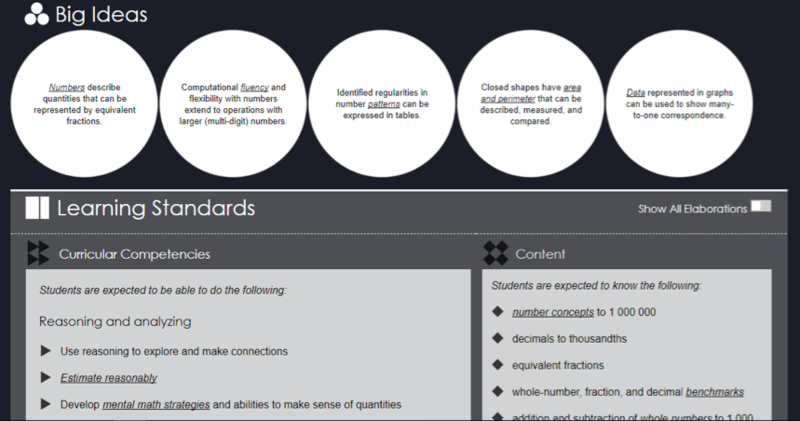 Students will be developing these competencies: reflect on mathematical thinking, connect mathematical concepts to each other. Depending on the age and current skill levels of your students you may adapt these ideas and do more strategies in one lesson or spend more than one lesson on one strategy. You can differentiate by allowing students who have mastered their facts to use this strategy for facts larger than those to 100. For example, this doubling strategy works well for figuring out 4 x 23 mentally. Once students have a solid grasp on the strategy, then we play a game to help them practice it. Can you see what students would be missing though and how many competencies we can engage when we let them explore the strategy using manipulatives, pictures, symbols and words? They are developing a deeper meaning and understanding which are crucial for this learning to be transferred to long-term memory. I will be writing more about Growth Mindset in Math next week. Good Luck! I hope you and your students enjoy the process of becoming mathematicians!